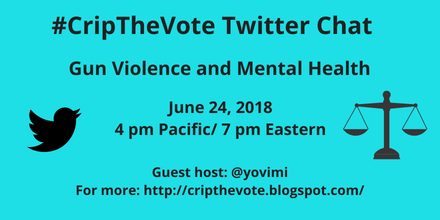 Graphic with an aqua blue background and black text that reads: #CripTheVote Twitter Chat, Gun Violence and Mental Health, June 24, 2018, 4 pm Pacific/ 7 pm Eastern, Guest host: @yovimi, For more: http://cripthevote.blogspot.com. On the left is an illustration of a black bird that’s Twitter’s icon and on the right is an illustration of the scales of justice. 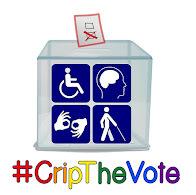 Join #CripTheVote for this important discussion of gun violence, gun control and people with mental health disabilities with guest host Victoria M. Rodríguez-Roldán, Senior Policy Counsel, Trans/Gender Nonconforming Justice Director, Disability Justice Project Director of the National LGBTQ Task Force. Please note: Since we have a lot of questions for this chat, we will run 75 minutes instead of 60. Rethinking LGBTQ Policy Series: Policy Recommendations For Gun Violence Prevention Using A Racial, Disability, And LGBTQ Justice Framework. Follow @GreggBeratan @AndrewPulrang @DisVisibility @yovimi. When it’s time, search #CripTheVote on Twitter for the series of live tweets under the ‘Latest’ tab for the full conversation. Welcome to the #CripTheVote chat on gun violence and mental health. We are delighted to have guest host @yovimi join us as guest host. Thank you for joining the #CripTheVote chat on gun violence and mental health. A special thank you to our guest host @yovimi for joining us today!